Happily, I can say that it was to be. 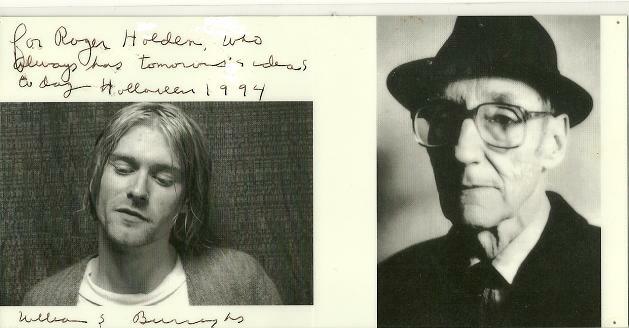 I am privileged in this life to have been a friend of William Burroughs and also a collaborator on his visual art — using the medium of the computer. 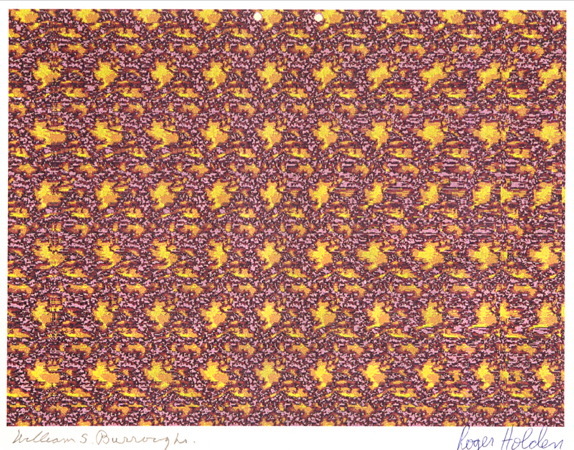 In 1995 I worked with Burroughs on a series of three-dimensional computer-generated stereograms (similar to the Magic Eye images of the 90s) based upon sampling his paintings. William guided me in the process of what to select for input into the computer so as to obtain results that he thought would be appropriate for this visual holographic cut-up collaborative experiment. This particular image is now in the permanent collection of the Spencer Museum of Art at the University of Kansas. This image may be viewed online at the following presentation created by the Spencer Museum of Art. It is the 6th image of 8 shown in the presentation. I am an inventor who has been aware of the philosophical, cultural, and audiovisual implications of the computer since 1976. I have always desired to expand this medium creatively. In 1982, for example, I designed the animation computer system used by PBS’s Emmy-winning children’s series Reading Rainbow to film their feature books for the first 5 seasons. Rogerreadingrainbow.com is my Reading Rainbow site. I also co-invented a holographic-like computer image projection system which was featured in 2005 on the Discovery Channel Science of Star Wars series. It was shown as an example of futuristic R2-D2 holographic-like technology being realized in the present. I am presently developing a different and superior holographic-like display technology. A short video of the Discovery Channel segment is at YouTube. I first met Burroughs formally in 1986 through his best friend and business manager James Grauerholz. 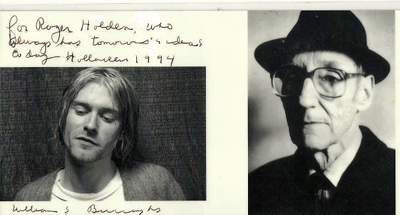 In 1988 I produced a music video tribute to Burroughs which aired the same year on the USA Network series Nightflight and also on MTV in 1990 on their first internationally broadcast series, Buzz. It should also be mentioned that throughout the years I was given two wonderful cats by William. One was the White Cat mentioned in Last Words: The Final Journals of William S. Burroughs and in the text on inter-zone.org. One day when I was visiting Burroughs in the early 90s, he said “Roger, I want to show you the painting I finished today. It’s called Jack the Ripper.” Looking, I discerned that it consisted of reddish paint splotches and twirls on a white canvas. William then said, “Do you see Jack?” I looked carefully and replied, “William, I might sense the ambience of Jack in an abstract sort of way.” Immediately he said, “No! No! No! Do you see Jack?” I said I didn’t, but please show me. He then pointed to a specific area, a small area toward the bottom right side of the painting. Sure enough, I did see it, a leering evil face with a derby hat on top of his head. It was cartoon-like, somewhat warped in appearance but immediately recognizable. Burroughs then turned the painting upside down. In the same exact area where I had previously seen Jack the Ripper he pointed and said assuredly, “There’s his victim.” He was right. There was an equally vivid warped caricature of a woman’s face grimacing in an expression of horror! It was absolutely amazing to witness this, as it was a prime example of what he would call a “Port of Entry” into an image. William painted with a faith that his process of painting could serve as a vessel for evocative magic. These emerging images were searched for and discovered only after he painted the entire canvas. Naturally, after that experience, I wished for the day that we could collaborate using the medium of the computer in a likewise visual and shamanistic manner. 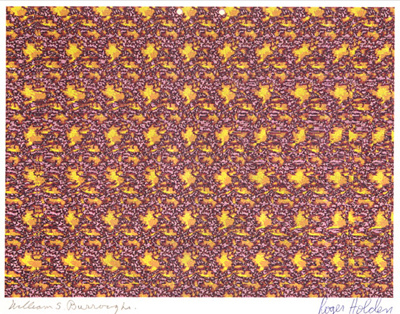 As 1994 wound up, I noticed his great interest and enjoyment of computer-generated stereograms. I had previous experience creating some of these myself so I asked him if we could collaborate together by incorporating some of his paintings into computer-generated 3D stereograms. His immediate reply was, “By all means, yes! Lets see what happens.” I first started on the project by using the entire painting as a source. Not much seemed to be happening with that approach. The output was thin and difficult to discern in 3D. Burroughs then directed me to incorporate small samples of his paintings into the computer rather than just simply inputting the whole thing. This was when we struck our pay dirt, as exciting bold 3D shapes began to emerge. Our collaboration was a true “all into cyberspace” experience for both of us. These images allow for a direct altered state of visual perception just as the Magic Eye images do. However, rather than simply entice you with just a dolphin or 3-D heart, the cybernetic cut-up images can be used to experience directly certain information processes of the mind — specifically, those processes that can form our visual sense of the 3D outside world from the input of even the simplest of sampled information. William was extremely enthusiastic about this collaboration and equally enthusiastic about the results. In essence, samples of his paintings were input as viral info elements into a 3D computer stereoscopic process. The 3D Cybernetic cut-up output resulted in complex holographic-like landscapes and objects. Our collaboration, including studies, involved more than a dozen images. Like all such attempts in art, some worked out better than others. A special few seemed to demonstrate some intriguing synchronicities. I hope to publish someday a compendium of these studies and completed images. Written by Roger Holden and published by RealityStudio on 2 March 2010.
very interesting. i hope to see that published compendium one day. a simple fact that pertains to all of his work, and something i’ve noticed that many burroughs aficionados still fail to grasp, or dismiss as kookiness. Excellent article. It would be almost impossible to think William would not be interested in using computers as yet another experimental vein in which to shoot his ideas. Or that’s how many of us are such fans of him.. I get in a lot of arguments with literary types, because I’m not particularly that sort of person, but I’m passionate about Burroughs. The vast majority don’t seem to ‘get it’. This article was great though, I think had he been born in the age of computing or it was more common (as common as a typewriter) it would have been a tool he used. Wonderful read. Great work Roger. So glad for the special interaction you had with Burroughs.